I'd like to bring you today the first installment of a mini blog series about carrier pigeons and their work in the Great War. My interest was inspired this summer by the sight of Cher Ami(e), the brave little carrier pigeon, whose steely determination and intelligence saved many human lives. 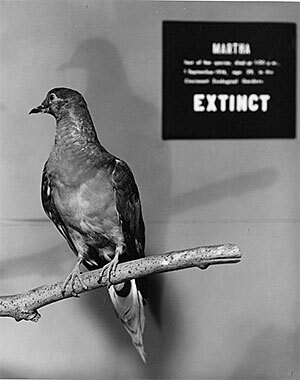 Though she did not have a direct connection to the Great War, another female pigeon has been generating a lot of buzz and a kind of collective indirect nostalgia recently--this is Martha, the last passenger pigeon known to humankind. While British Great War history is our usual province here at Ghosts of 1914, today we cross the Atlantic back to the United States for a brief glimpse of this enigmatic bird's story. 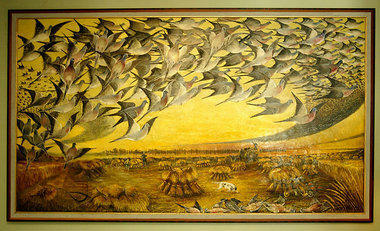 Lewis Cross, Passenger Pigeon landscape. © Lakeshore Museum Center, Michigan. Cross captures the sense of infinite plenty, the sky-darkening profusion, that might have led people to believe that there could be no end to the passenger pigeon. The swirl of birds in the painting could be taken for a kind of cornucopia, with its wrapping horn-like form. It is a kind of infinity symbol, arcing this way and that across the horizon. There is a dark presentiment, though, in the tapering trail of birds heading into the distance at the right. The pigeons swoop around and into this dwindling formation; Cross, who painted this piece years after Martha's passing in 1914, in this way shows us the past and present, the broad swath of birds stretching overhead and the tiny trace towards which they move. Audubon sketch of a passenger pigeon, 1809. The passenger pigeon's extinction centenary is a strange anniversary of sorts. It is a moment to mourn the solitary bird, Martha, whose rusty breast, soft brownish grey wings, and striking red-rounded eyes are quite haunting. What a burden to be the last of her kind! It is also a moment when those who never could have seen a live passenger pigeon are made wistful and sad at the thought that any species so visibly available at one moment could vanish in virtually the next. There are even proponents of bringing the passenger pigeon back, using modern DNA research and other technologies to resurrect a species that we identify today with still-shocking invisibility. There is so much good content available online about the passenger pigeon. I'll close this prologue to our eventual foray into carrier pigeon history with some links for the curious. The New Yorker: "A Century of Extinction"
University of Michigan LSA: "100 Years Without the Passenger Pigeon"
The Guardian (review): "The Passenger Pigeon by Errol Fuller"